Lowest priced home in Malibu and one of the only properties in Malibu with views of the Channel Islands, Ocean, Oxnard city lights right through the untouched Serrano Valley & Boney Ridge. Located off the Mipolomol dirt road, this property 360 degree views of nature and flat land in front and back of the home allowing you to create beautiful outdoor areas to enjoy both sunset and sunrise views through the mountains and ocean. This area of Malibu is the least disturbed area in the Mountains perfect for those finding to get away from the city and be in a place where the stars can be found in the sky with little light pollution around. 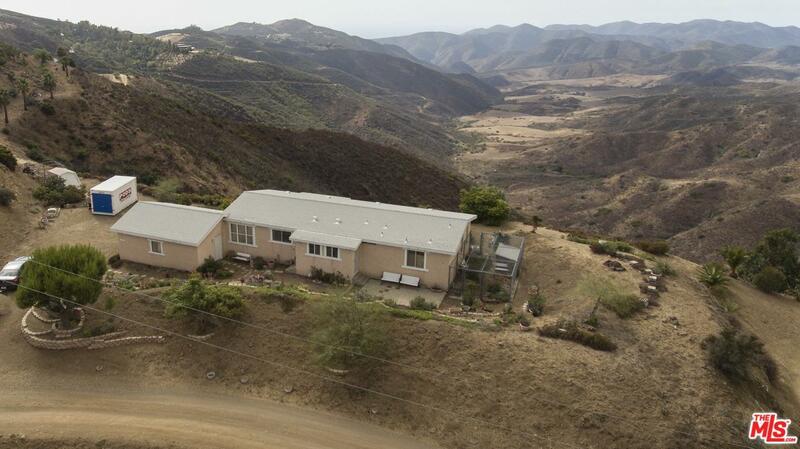 The home is perfectly situated to allow the living room and both bedrooms to have the view through the Serrano Valley mountains and into the ocean with Channel Islands in the background. Make this home your perfect getaway that is still only 15 minutes to Trancas/Malibu Schools and 20 minutes to Camarillo & Oxnard. Sold by Mark S. Gruskin BRE#01929872 of Westside Estate Agency-Malibu. Listing provided courtesy of Daniel Moss DRE#01929872 of Coldwell Banker Residential Brokerage and Bill Moss CA DRE# 00860010 of .